Today is Memorial Day, and our social media feeds are filled with photos, memes and articles honoring the fallen soldiers. These are proper and valuable, especially in these days where even on a holiday weekend we run from one event, task, or source of entertainment to the next without pausing for even a moment to remember the significance of the day and what it is we're supposed to be celebrating. Nestled amongst those necessary poignant reminders are others, ranging from humorous to downright hostile, that tell us how Memorial Day is "not about a barbecue." Those statements are correct, as far as they go. Memorial Day is not about a barbecue, any more than Christmas is about going to the mall. Memorial Day, as all American Holidays -- in fact, as most national Holidays in the world -- is about more than the shallow manifestation of its celebration, but also more than its original intention. It's part of our national identity, our traditions one of the many things that still hold us together even in current times of political strife. Yes, first and foremost, today is about remembering the sacrifice of the fallen. It is also about taking time to think of them, not as faceless multitudes, not as torn up bodies on faraway battlefield, but as individuals. They dreamed, laughed, had interests and hobbies; had family and loved ones. Each life was unique and valuable, and all of them were cut short. Perhaps it is proper, then-- having paid respect to their memories, whether by thought, by prayer, by attending a local parade, or by visiting a military cemetery-- to spend at least part of the day enjoying the comforts of our lives, including food and drink, family and friends. We get to live our lives, the way we want to, because countless others didn't. 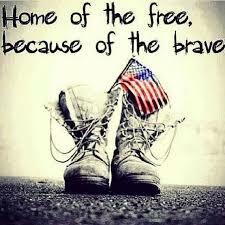 But be sure to remember your enjoyment, your comfort, and more importantly your freedom came at a cost. Ask yourself if you've done enough to keep that freedom, for yourself and for generations to come. Resolve to do more, today and every day. There might be a price to pay-- there always is a price, even here and now-- in loss of friendships, financial comfort, family harmony, or even employment. Yet it pales in comparison to what those who came before us have already given. Don't feel guilty over the fallen soldiers' sacrifice. Just make it all worth it.